Are you keen to teach your child about wildlife? Are you thinking of gifting him some Panther coloring pages? Then this is the perfect article for you! Panther refers to three different types of big cats – jaguars, leopards, and mountain lions. They are one of the most physically impressive creatures in the world. Hopping, running and climbing is never a problem for these agile cats. 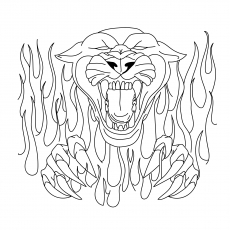 If you want your child to know more about this wildcat, then please go ahead and share these ten coloring pages with him. 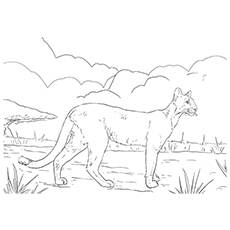 The coloring page features a majestic panther roaming the highlands. Panthers usually inhabit the rainforest, mountain, desert and savannas of Asia, Africa, and America. 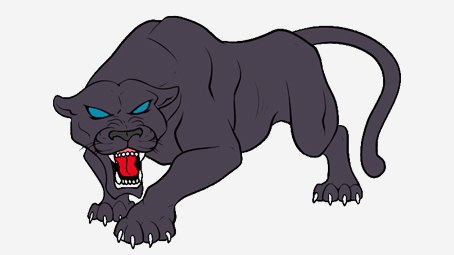 Tell your child to use dark brown or yellow to color the body of this panther and emerald green for his eyes. Here is an educational worksheet featuring a Florida Panther. It can help you enlighten your child using the play way method. The tan colored Florida Panther is one of the subspecies of cougar. As the name suggests, you will find the animal in the subtropical forests and swamps of Florida. 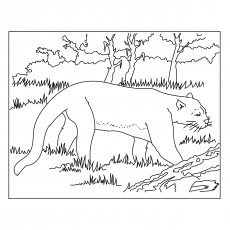 The panther coloring page states that the animal has a crook at the end of its tail and a cowlick in the middle of its back. 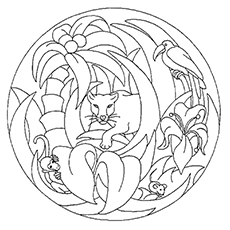 The coloring sheet features a panther in the jungle. The mice, monkey, and bird look terrified of him as they try to hide. Black Panther, fondly called the “ghost of the forest,” attacks its prey in a smart and stealthy way. The dark coat of the Panther helps it to hide and stalk its prey easily, especially at night. The term Black Panther refers to a black jaguar native to America or a black leopard inhabiting the jungles of Africa and Asia. The Black Panther has spots that are quite difficult to see due to its dark fur. Do you know why the Black Panther has a dark color? The Black Panther gets its dark coat due to melanism. 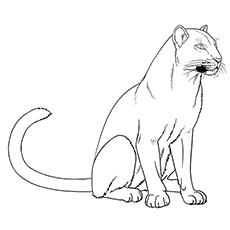 The panther coloring sheet features the animal in a very agitated mood. It may be hungry and on the prowl for prey to satiate its appetite. 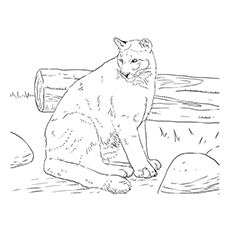 Ask your child to color this image carefully without irking this wild cat further. 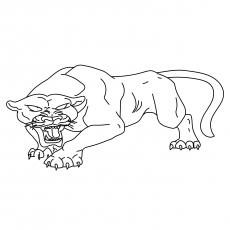 Here is a simple outline of a panther. Panthers are usually quiet animals, and they only communicate through sounds like peeps, purrs, chirps, moans, growls, whistles, and purr. They stay in a variety of habitats like swamps, prairies, and forests. Panthers are most active between the dusk and dawn. 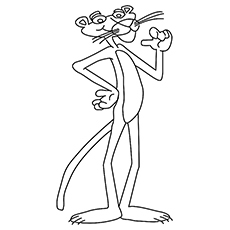 Here is an iconic Pink Panther coloring sheet. He is the eponymous protagonist of ‘The Pink Panther Show’. He is a tall and lanky pink panther with circular ears, yellow eyes, and a triangular nose. Here’s another image of a black panther sitting near a log. Do you know it can climb the tree easily? In fact, the Black Panther is capable of leaping up to 20 feet high to catch its prey, which often includes monkeys, deer, rabbits, and birds. Black Panthers also have an excellent eyesight, sharp ears, and a strong jaw. 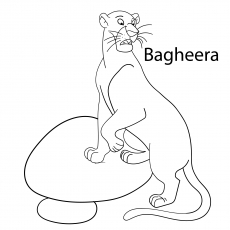 The panther coloring sheet here shows Bagheera resting on a branch of a tree. Bagheera is a character from Rudyard Kipling’s ‘Jungle Book’. He is the protective mentor of Mowgli. He is a lithe, dark gray panther with yellow eyes, black eyebrows, and numerous whiskers. Here is a panther pictures to color where the animal is taking a stroll after a hearty lunch. Panther is an endangered animal now because of the loss of its natural habitat due to global warming and environment pollution. Its population is depleting steadily also on account of extensive hunting. 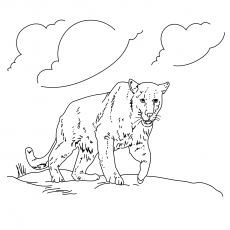 These ten Panther coloring sheets will keep your child entertained during his spare time. These coloring pages will also fine-tune his motor skills and improve his hand-eye coordination. Tell us which image from the series is your child’s favorite and do share his artwork with us.